Forget whatever else is going on in the news right now: just look at this massive egg! Stockman's Eggs in Queensland, Australia posted a photo of the humongous egg on Sunday, and it's a thing of beauty. Owner Scott Stockman told ABC News that the egg weighed 176g, and looks more like a goose egg than one from a chicken. 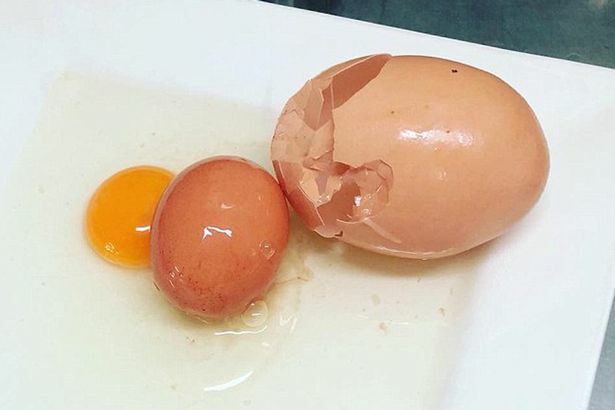 The occurrence of an egg inside an egg is called a counter-peristalsis contraction, and it happens when an egg that isn't ready makes its way towards the 'vent'. However, before it is laid, it goes back up inside a chicken's reproductive line. Ouch. When the egg returns, a second egg then forms around it. It is a very rare thing to see two fully formed eggs incubate together and laid by the chicken. Associate Professor Raf Freire, from Charles Sturt University's veterinary sciences school, explained: "Biologically, I'm struggling to understand why that smaller egg never dropped out, it's very odd." Two for the price of one, not bad.